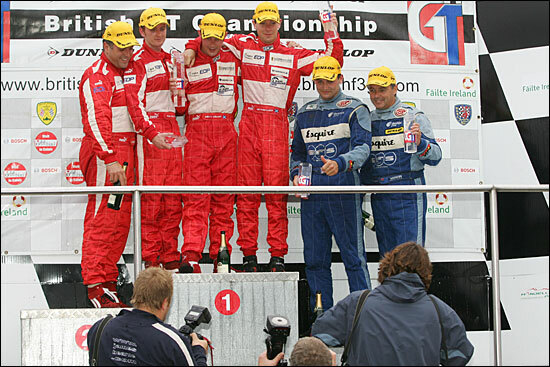 One meeting and two races left in the 2005 British GT Championship, and Embassy Racing, in only its second year of motorsport, is neatly tied in second place in the teams’ chase, and Neil Cunningham are the third pairing in the driver’s championship – two ahead of the chasing Jordan / Caine, seven behind Niarchos / Mullen. So there’s everything to play for at Silverstone next month, for the last pair of races. 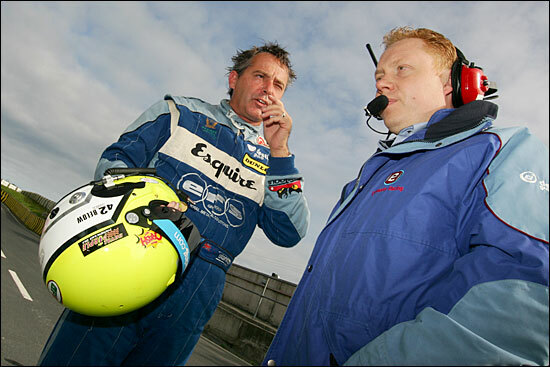 Whatever happens there, the whole team can think back to the same circuit, and the best race of the 2005 Championship. Yes, Collins and Cunningham won it, but that’s not why it was the best race: the finish was a thriller, Neil taking the lead a few corners from the end of the last lap, in a two hour event. 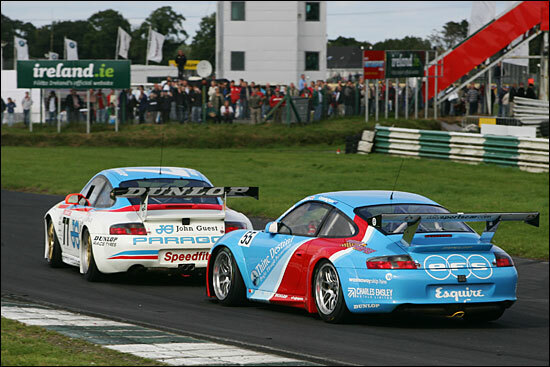 It was back to the ‘standard’ pair of one hour races in Ireland, and although the entry size was a slim 15, all the significant GT2 runners were present. 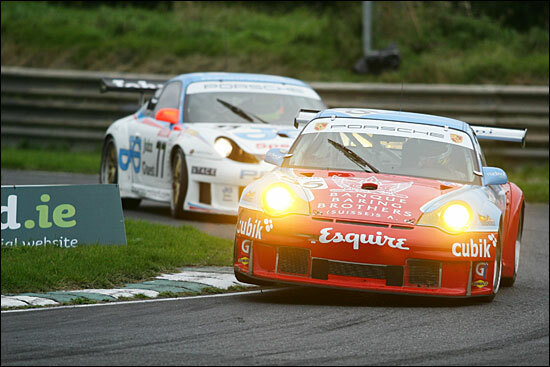 But without any wet weather – a surprise that, in Ireland – the Embassy Porsche was typically just off the pace of those Ferraris. “It was a second and a half, as usual,” was the opinion of Neil Cunningham. 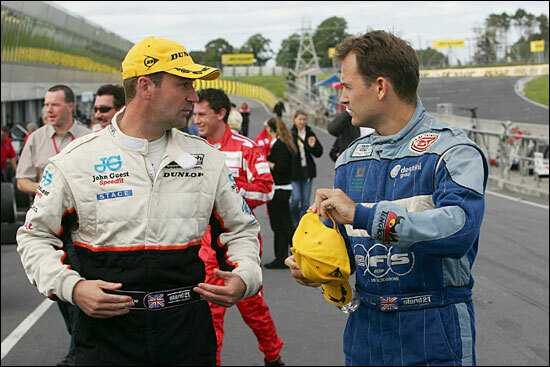 The races would follow the normal, 2005 format: who could be best of the rest? After two hours of racing, the score was one each to Embassy and Team Eurotech, which was a contination of the season-long battle between these two teams. Jonathan France, with Neil Cunningham, below, doesn't like to be not winning though. 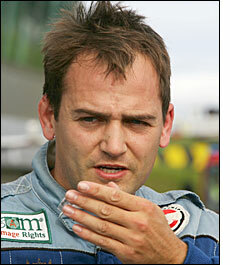 “Yes, we were closer in testing, closer than we’ve ever been, but that damper problem in qualifying meant the gap was bigger,” commented Ben Collins. 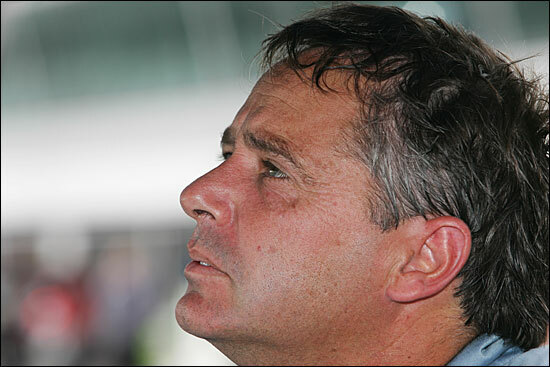 Mike Jordan was second quickest for Eurotech, and with Chris Niarchos down in sixth in the other Ferrari, the race would be between these four entries – plus the pesky Nissan. “I tried to go round the outside at the first corner, but had to be a cautious out there, and dropped to fourth behind the Nissan,” explained Cunningham, afterwards. 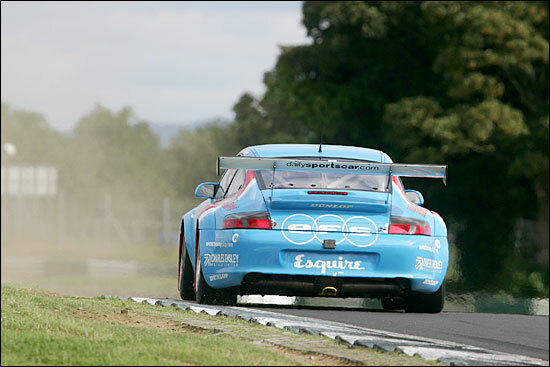 The 350Z was being driven very defensively, but a well managed pistop (under the safety car, so a short stint for the Kiwi / Australian) saw Ben Collins out with the bit between his teeth, and he got the better of both Anthony Reid (Nissan) and Michael Caine (Eurotech Porsche). Sunday’s race – no rain again – saw the blue and red Embassy car having to tackle the same two rivals: that damper problem meant that Ben’s qualifying time, just a tenth faster than Neil’s (well-matched, eh? ), was ‘only’ good enough for fifth on the grid. 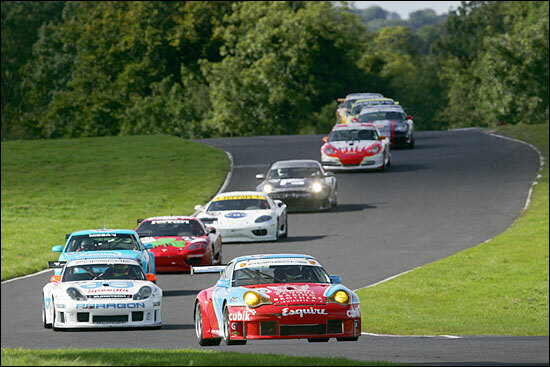 So a Ferrari 1-5 on Sunday, a Porsche 2-3, and it’s all set up for the finale at Silverstone early next month. The Embassy pair could take runner-up spots in both championships (drivers and teams): will Silverstone favour the brave, again? Embassy is still the only team other than Scuderia Ecosse to have won a race this year. 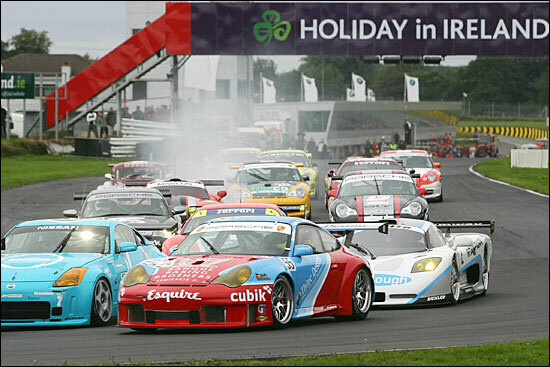 The enterprising Embassy team will be launching a competition shortly, to win two Embassy VIP full hospitality tickets for the final British GT meeting, race at Silverstone on October 9. Race tickets, VIP pack, breakfast, meet the team, sit in the car, lunch and gift pack to take home. Details soon.